Set for rerelease after Asghar Farhadi’s peerless, Oscar winning A Separation last year, About Elly (Darbareye Elly) is it’s less impactful predecessor, dealing with the similar themes of deceit, contempt and gender politics in Iranian society. A bit of a reviewer’s nightmare, About Elly is a movie best approached uninitiated. I’ll tread carefully. A group of middle class Iranians – made up of families and two singletons – head to a beachside villa for a summer getaway. They arrive to find the building is decrepit, with broken gates, smashed windows and threadbare furniture. Discouraged, the democratic bunch take a vote on whether to stay or bail, eventually deciding to unpack and make the best out of a bad situation. Amongst the bunch is the maternal busybody Sepideh (Golshifteh Farahani – perhaps the most beautiful woman to be filmed, ever). She brings along her friend and daughter’s teacher Elly (Taraneh Alidoosti), with the ulterior motive to play matchmaker and set her up with Ahmad (Shahab Hosseini), a recent divorcee returning home from a stint in Germany. Whilst this might appear a fairly innocuous plan, it’s the trigger that will lead to a disastrous rift in the group dynamic, ending in nothing less than tears and tragedy. Farhadi impresses with a great fluidity to his storytelling. The opening forty minutes is seemingly apolitical and light-hearted, with the group playing charades and generally enjoying the vacation. It sets the audience into a false sense of security; what could go wrong with this happy picture? When things start to bleakly unravel, Farhadi and his magnifying ensemble cast manage to quickly create suspense and tension almost out of nowhere. Just like A Separation, webs of lies are spun to illustrate the decline of the democratic unit. Where morality is questioned and expediency prevails. Farhadi’s camerawork is joyous and politically vented too, never afraid to keep hold of a lingering close up or invade his actor’s personal space. The once moderate gender portrayals are muddied when Sepideh enters the troubled waters. With the camera submerged alongside, we see her almost drowning in the hijab she is forced to wear. Then there’s Elly who – realising she is being paired up against her own free will – runs along the beachfront flying one of the kid’s kites. It’s a powerful, purely cinematic moment which Farhadi doesn’t let up on; an allegory for the women who long for liberation from their controlled and undermined place in Iranian society. Whilst A Separation left me in a blubbering mess on three separate occasions, About Elly is a less affecting movie, yet Farhadi still trusts in the intelligence of his audience to make up their own minds out of the film’s central moral dilemma. It’s a gripping relationship drama, using the raw confines of Iranian society to create something with universal appeal. About Elly has a selected release at the Curzon Soho and various Picturehouses across the UK from Septemeber 14th. Elsewhere, you can stream it at NetFlix & LoveFILM. 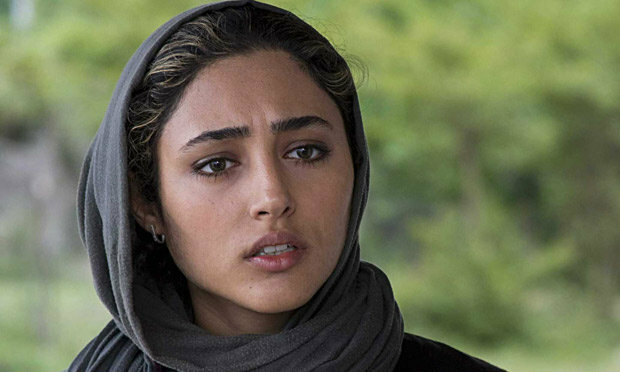 This entry was posted in ★★★★☆ (4) and tagged A Separation, About Elly, Asghar Farhadi, Berlinale, Darbareye Elly, Golshifteh Farahani, Iranian Cinema, Jodaeiye Nader az Simin, Merila Zare'i, Peyman Moadi, Shahab Hosseini, Taraneh Alidoosti. Bookmark the permalink.